Massapoag Sunfish Fleet News: I See Sunfish... They're Everywhere! I See Sunfish... They're Everywhere! This is just some of the boats at the Sunfish Regional Championships this weekend. It was impossible to get al of them into one shot. It was the weekend the Sunfish took over the lake as the Wequaquet Lake Yacht Club hosted part II of the New England Regional Championships. The club was bursting at the seams as thirty nine boats competed in the open division, while another five took part in the youth division and three in the double-handed division. 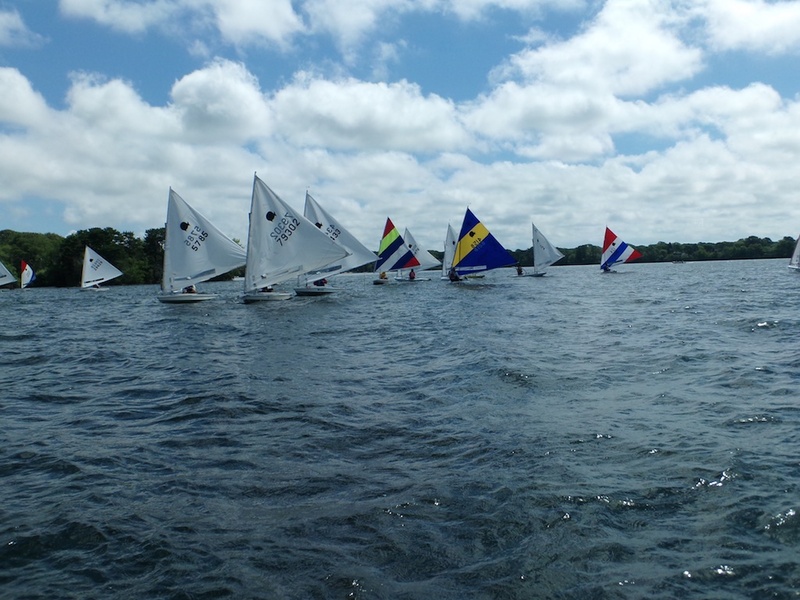 It was also the toughest fleet at a Sunfish regatta in a long time, as sailors came from all over the country to compete, with many of them making a double header of Wequaquet this weekend and Massapoag next weekend for the Masters North Americans. The weather couldn't be any better, as 10-15 knot winds pushed the fleet fast enough to allow for 6 races on day 1 and 3 more on day 2. Doug Kaukeinen had an unbelievable weekend taking first place with 16 points in 9 races and no finish worse than 3rd for the whole regatta. Dan Hesse took second, 10 points behind Doug, and Amanda Callahan continued her winning ways, taking 3rd in a tiebreaker with Bill Brangiforte. Massapoag's Kevin Buruchian came in 7th. Next week is the Master's North American Championships at Massapoag. It looks to be another strong fleet. Since Kevin Buruchian is too young to compete he is going to serve as PRO. Diane Kampf is once again outdoing herself as Regatta Chair to make it a great time for everyone.